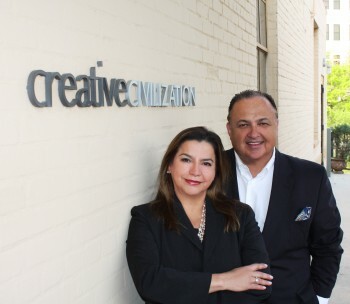 Together, Adolfo Aguilar and his wife, Gisela Girard, launched Creative Civilization, a “new breed of advertising agency; one that happens to be Hispanic-owned and operated but responsible for total marketing.” The agency counts the San Antonio Spurs and Sam’s Club as clients. He credits much of his success to being at the right place at the right time. In the 1980s, when corporate America recognized the Hispanic market as an emerging consumer segment, Aguilar caught the wave that raised him high above his competition. Shortly after graduation, Aguilar accepted a job with one of the world’s most recognizable brands—Coca-Cola. Including Aguilar, the corporation hired three Latinos to target Hispanic consumers on a local and national level. “In addition to creating national marketing programs, we recruited and motivated bottlers in communities like Miami, Phoenix, Houston, Chicago, Los Angeles, and San Antonio,” Aguilar says. Aguilar was enjoying his early 30s when the Hispanic market buzz was going crazy. In 1999, he and his wife, Gisela Girard, decided it was time for Hispanic individuals to embrace something bigger—holistic marketing. Together, they founded Creative Civilization, a new breed of advertising agency; one that happens to be Hispanic-owned and operated, but is responsible for total marketing. “The first client to believe in us was the San Antonio Spurs,” says Aguilar. The Spurs were the only National Basketball Association (NBA) franchise in history to hire a Hispanic-owned and operated agency as a general marketing agency, but other clients soon followed suit. “Publications, hospitals, and transportation systems all liked our total marketing approach.” Creative Civilization played an important role in making the San Antonio Spurs one of the most successful franchises in the NBA, and when the team won the championship in 2005 and 2007, it awarded Aguilar and his wife with their very own championship rings. “What an incredible treasure!” Aguilar says. Most recently, Sam’s Club has hired Creative Civilization to perform strategic planning, creative media, public relations, and total marketing across the country, as well as some Hispanic marketing.